The water was cold, and the rocks slippery, but we breathed quickly and plunged into the clear green pool, catching splashes from two nearby waterfalls on our faces. We were swimming at picturesque Ti Tou Gorge, deep in the lush tropical forest of Dominica (pronounced Dom-in-eek-a), at the very same spot where cannibals chased Johnny Depp in Pirates of the Caribbean, Dead Man’s Chest. We paddled into a dark freshwater cave and then through a narrow gorge, wide enough for only one body at a time. Notable because hot and cold streams converge and intermingle here, the crevice opened into a large pool of clear water. We swam against the left wall of the cave in order to avoid underwater boulders that were close enough to the surface for scraping knees and feet. Creeping further through the chilly water, we came to another waterfall with its swirl of foam topping the crystal water. We climbed a rocky ledge and marveled at the amazing scenery and then splashed back into the water for a return trip through the gorge and cave. Ti Tou Gorge, one of Dominica’s spectacular natural features, is easily reached from several points in Morne Trois Piton National Park, designated a World Heritage Site by UNESCO. Tour companies take island visitors and cruise ship guests to this unique spot, often as part of longer tours that include other major attractions in the national park region. Not known for beautiful sandy beaches that attract visitors to other Caribbean islands, Dominica’s fame lies mainly in its untamed beauty. It is the largest and most mountainous of the Windward Islands, owing to its volcanic origins. Several peaks top out over 3,000 feet, with the tallest, Morne Trois Pitons at 4,600, giving its name to the national park where Ti Tou and other attractions are located. Tales of piracy and buried treasure fill Dominican history and folklore, making it a particularly fitting spot for filming scenes of the Pirates movie. 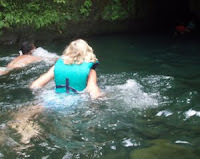 Other points of interest on our daylong tour included snorkeling at Champagne Reef, driving to Emerald Falls and Trafalgar Falls (in different parts of the rain forest), and visiting an old mountain plantation with lovely valley views.